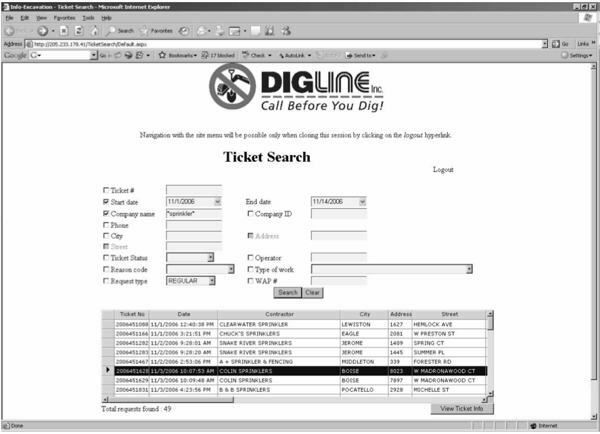 Teldig Web Ticket Search Program allows Members, Contractors & Operators search Dig Line’s Ticket Archive for tickets with specific parameters. 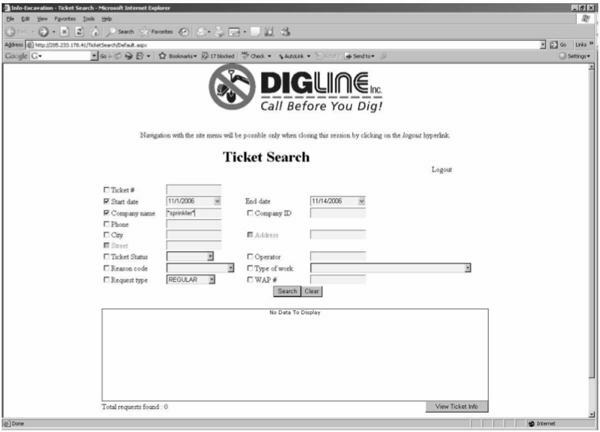 Member Utility Companies can search all tickets that have been transmitted to their company or locating company. The search parameter allows up to a 14-day search span. Dig Line stores no more than 5 years of ticket history. Your username and password will be contained in your welcome packet. Please contact us to recover your credentials if they have been misplaced. Any person who has requested a locate marking can search all tickets that have been generated with their Contractor ID number. The search parameter allows up to a 14-day search span. Dig Line stores no more than 5 years of ticket history. Operator – Dig Line personnel. Select parameters for the Ticket SearchLimit no more than a 14-day span per Date Search. Fairview Ave can be searched as *fairview*. This will include all streets with Directional in front and street types, i.e., Ave., St., Rd., etc.Contractor Name: If not sure of Excavator’s proper name, include Wild Card (*) in front and behind the name, i.e. The Sprinkler Shop can be *Sprinkler* will include all companies with the work sprinkler in their company name. Select ‘Search’Ticket Search will list all possibilities within Search parameters. Remember: “Less is More”. More Search parameters will limit the number of selections. Items will be in Ticket Numerical Order Only. Total Number of Requests Found is listed at the bottom of the window. 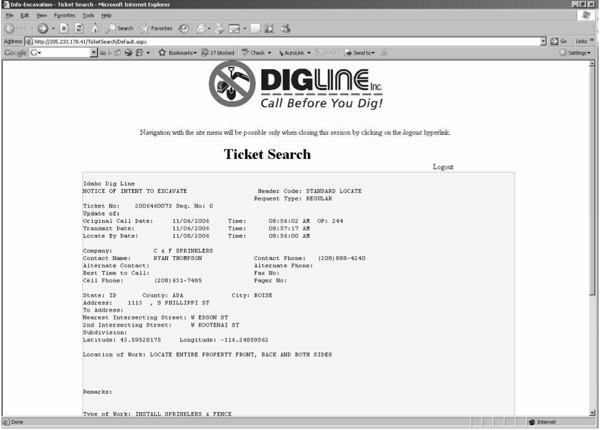 By using the slide bar on the side or bottom, information on the tickets is visible. 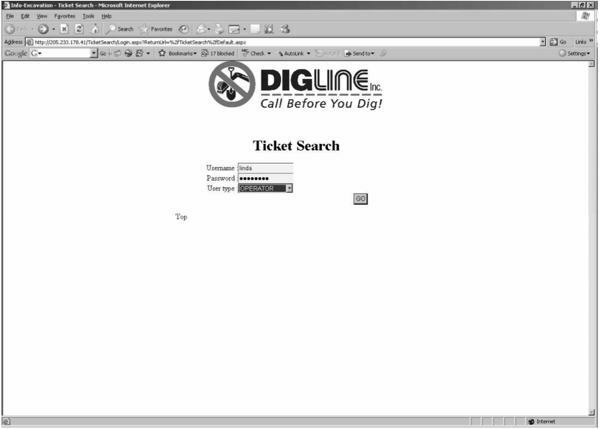 Select the Ticket by clicking the cell to the left of the Ticket Number. Go to ‘File’> ‘Print’ in you Internet Explorer. THE PRINT STATUS WILL BE UPDATED PRIOR TO FULL IMPLEMENTATION. If Search is complete, ‘Logout’ or if additional Searches are needed, Select ‘Back’ and ‘Clear’ Search Information and Start Over.